Recent health and wellness literature has been asking audiences to consider whether antibiotics have contributed to the growing obesity epidemic. Even mainstream publications have caught on. With fear-inducing headlines like “Are Antibiotics Making People Larger?,” it’s no wonder people are becoming more and more scared of antibiotics. 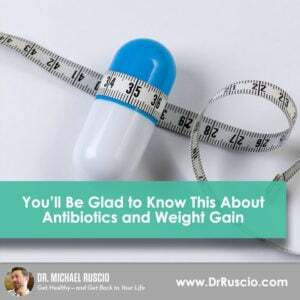 Get help with antibiotics and weight gain. If you protect your precious gut microbiota with a healthy supply of antibiotics, that’s great. As a country, we use far too many antibiotics liberally. However, I want to take a moment to make sure this healthy suspicion hasn’t progressed into an unnecessary fear. While it’s important to be careful with your gut health, I believe it’s just as important to make sure we don’t take data that shows correlation and extrapolate it into meaning causation, which can cause unjustified worry. Correlation simply means there is a relationship between two factors. For example, maybe there’s a change in your gut microbiota makeup after a round of antibiotics. Causation means there is an actual cause and effect. For example, if a particular antibiotic directly causes a lower level of one type of bacteria. This would need to be proven through eliminating other factors that may have caused that bacteria’s decrease. Throughout the years, we’ve had far too many health information bubbles that were taken from correlation and incorrectly stretched to assume causation. Consider the saturated fat debate. We now know that saturated fat doesn’t clog arteries, but it’s so simple for our minds to create the image of fat lining our arteries like clogged pipes. We’ve reduced the complex bodily functions of fat metabolism into a far too simple “fat intake = fat in the body” equation. Let’s be sure to not make the same mistake with antibiotics. Because antibiotics have been shown to a) change the microbiota of the gut and b) negatively impact the metabolism of children, many have been quick to make that easy but misleading leap to assume that this means therefore antibiotics will negatively impact the metabolism of adults. Sure, antibiotics by nature manipulate some of the bacteria in our guts. But does this mean that a typical dose of antibiotics in adults actually damages their metabolism and causes weight gain and high blood sugar? Let’s dig a bit deeper. A 2016 study on 57 obese, prediabetic men, examined the impact of seven-day doses of amoxicillin, vancomycin, and a placebo. This double-blind study was an intelligent design because it involved people who are more prone to negative metabolic impacts. And the placebo patients provide the necessary baseline to ensure the treatment group results are statistically significant. “Vancomycin, but not amoxicillin, decreased the diversity of bacteria and lowered Firmicutes” – Simply meaning, bacteria changes were observed when antibiotics were administered. Firmicutes is a group of bacteria involved in short-chain fatty acid and bile acid metabolism. After vancomycin was administered, there were less Firmicutes present (a bacteria commonly associated with obesity). “Adipose tissue gene expression of oxidative pathways was upregulated by antibiotics whereas immune-related pathways were downregulated by vancomycin” – Meaning that mechanisms within fat cells, fat cell metabolism, and the immune system were altered by the antibiotics administered. Tissue-specific insulin sensitivity – an issue that can lead to type 2 diabetes. Energy/substrate metabolism – how your body uses different substrates (carbs, proteins, fats) in metabolism. Postprandial hormones and metabolites – factors that help you feel full. Systemic inflammation – systemic inflammation can cause metabolic disorders or metabolic syndrome. Gut permeability – or a leaky gut, which is known to impact metabolism. Fat cell size – larger fat cell size may indicate a higher risk of type 2 diabetes. All of these factors are extremely important to an overall healthy metabolism. And this study revealed that a seven-day dose of antibiotics had no clinically relevant impact on the metabolic health of the 57 obese patients in these areas. That’s six different important indicators of metabolic health that showed no negative impact after antibiotic use. And what’s more is that in an eight-week follow-up, these patients showed no clinically relevant changes in metabolism indicators, even though their gut microbiota had remained considerably altered. This is a classic case of where correlation does not necessarily mean causation! You’re careful about your antibiotic use and that’s wonderful, but don’t unnecessarily cause yourself more harm because you’re scared of antibiotics. Remember, in a study with patients who are particularly prone to metabolic struggles (obese and prediabetic) than that of a healthy adult, antibiotics had no clinically relevant impact on their metabolic health, meaning the adult microbiome appears more hearty than we give it credit. There’s a lot of well-meaning advice out there, but there’s also a lot of fear-mongering. Usually the best advice is somewhere in the middle with balanced information. As with most health choices, it’s important to always weigh the pros and cons of any decision – and antibiotics are no exception. If you are suffering from a condition that would benefit from a round of antibiotics, consider your all options with your doctor and without the unwarranted fear of antibiotics.